Peter Walnes deals in high-end secondhand photographic equipment, both digital and film. We buy, sell and trade secondhand Leica, Nikon, Canon, Sony, Voigtlander, Zeiss, Hasselblad, Rollei, Sinar, Linhof, Arca Swiss, Schneider, Rodenstock, Alpa, Angenieux, Kinoptik, Kilfitt, Cooke and many other interesting makes. To get our very best price offer for your camera equipment, please contact us! Mail order is our speciality. We ship beautifully-packed items all over the world every day. Most items have a 12 month guarantee. All prices include VAT. We do our very best to describe the condition of our items carefully and honestly. In any case, all secondhand items are sold with an unconditional 14-day return privilege. If you are unhappy with your purchase for any reason, just return it within 14 days of invoice date and we will refund the purchase price in full. There is absolutely no risk! Because more than 50% of our sales are outside the UK, we have a huge and ongoing demand for high-end camera equipment, both film and digital. We will buy your camera equipment for outright cash or will sell it for you on a commission (consignment) basis. We can arrange free collection and shipping of your items from any address worldwide, not just in UK. If you have anything you might like to sell, please contact us! THIS LIST CHANGES DAILY, SO PLEASE COME BACK OFTEN! We ship everywhere worldwide (including China and Russia) and we have some of the lowest shipping charges in the industry. Wonderful buyer! I thought the process would take a lot longer but everything (including shipping and payment) took less than 24 hours total. Very pleasant and polite company to do business with. I shall return in the future! Thank you for the Nikon items that arrived yesterday, all in far better condition than your gradings suggested. I am delighted with the equipment and the prompt delivery. Thank you for the absolutely excellent service. I have never dealt with you before so there was obviously some apprehension when buying online but I have been extremely impressed with the experience. I know I will be back!!! Japanese Leica copies, e.g. Leotax, Canon, Honor, Nicca, Tower, Tanack etc. etc. Hugo Meyer Kino Plasmat/Makro Plasmat/Primoplan etc. Phase One, Leaf and Sinar digital backs. LF-Topcor, Voigtlander, Goerz, Wollensak etc. Broncolor, Dedolight, Elinchrom, Kino-flo, Profoto etc. Free collection can be arranged for purchases over £300. For large collections, we can visit for viewing. If your item(s) are not listed, please contact us anyway. We may still be interested! PLEASE NOTE: We can now arrange free collection and shipping of your items from any address worldwide, not just in the UK! I had quite a mixture of camera equipment following closure of my studio. I had no real idea how to value what I had and couldn't face the potential horrors of Ebay. I didn't especially trust retailers to give me a price either. Fortunately I found Peter online and was able to liquidate my remaining items. I'm very happy indeed to recommend Peter's service to anyone in a similar predicament. His valuations were extremely fair but more than this, his processes are incredibly efficient and absolutely painless. Peter organises speedy collection of goods and extremely prompt payment then follows. My understanding is that Peter has been in the business for a long time and his safe hands wouldn't still be around if he couldn't deliver on his offers and promises. Having been kindly given a 1970's Leica, I was unsure the best way to achieve a sale at a fair market value. The ebay lottery wasn't appealing. I approached a couple of London camera stores a year ago who were very sniffy about dealing over the phone and by email. I gave up. The other day I came across Peter Walnes' website. I contacted Peter and within an hour, he had assessed the value of the camera and offered what I considered a fair price. He arranged and paid for a UPS pickup and made payment as soon as it arrived. Throughout the selling process Peter provided me with the surety and confidence that I was dealing with a professional. A completely refreshing approach to business built on mutual trust. Peter Walnes is the UK stockist for Tom Abrahamsson's Softrelease. It's a convex (dome-shaped) button that screws into the shutter release, using the same thread as the cable release. It fits most cameras that have this thread including all Leica M and R, Leicaflex SL, Nikon FM, FE2, F3T, Nikkormats, Voigtlander Bessa L and T, new Zeiss Ikon, Kodak Retina Reflex, Retina IIIc and IIIC, Fuji 645 (rangefinder), Pentax (not LX) Rollei 35, Canonet G-III, QL17 and Konica Auto S3. It costs £24 including VAT in a choice of chrome, black, red, green, blue and purple. 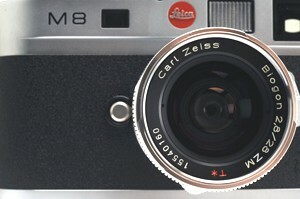 We also stock the Mini Softrelease for Fuji X-system, Bessa, Leica M and most mechanical cameras. These are available in chrome, black or red. The price is £24 including VAT. For owners of Leica M 240, M-E, M-P 240, M 262, M-D 262 and M Monochrom, we have the M-Softrelease and Mini M-Softrelease, £24 including VAT. We post all items on the same day or the next working day. Items delivered within UK should take 1-3 working days according to the shipping method selected. Outside UK items should take 2-10 working days according to the shipping method selected and the destination.